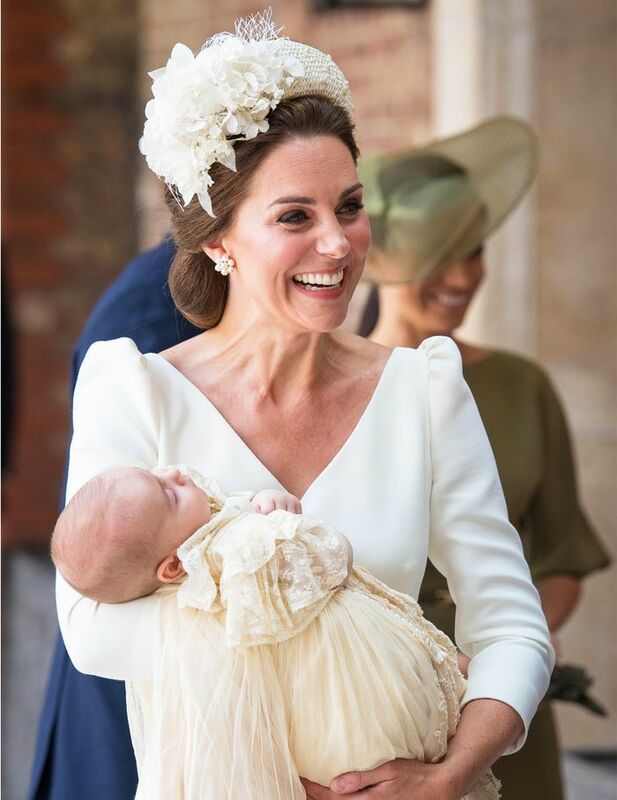 Today, Prince Louis is being baptised at the Chapel Royal at St. James's Palace, and he was carried into the chapel by the Duchess of Cambridge, who's wearing her go-to designer for special occasions, Alexander McQueen. She wore an ivory dress with a deep-V neckline, puffy shoulders (reminiscent of the silhouette Princess Diana often turned to) and a fluted skirt. This sleeve detail is one Kate's particularly fond of this year—at the Trooping of the Colour, she wore a pale blue dress with the same pronounced shoulders. It's her headband, however, that really got our attention, as she wore a wide band in a matching shade with elaborate flower embellishments to the right hand side by the milliner Jane Taylor. Blair Waldorf would be ever so proud. Taylor has created hats for Kate numerous times before, including one for Prince George's christening. Next up, see more on the curveball colour Meghan wore to the royal christening.